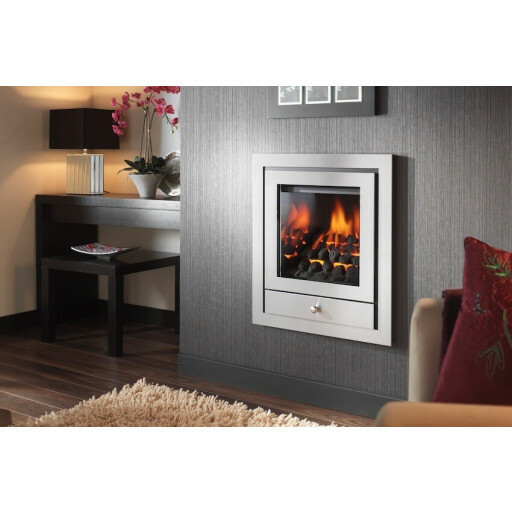 The Bellageo Blaze Deluxe gas fire is an inset hole in the wall gas fire that is the perfect choice for smaller spaces where a traditional fireplace might overwhelm the room. It features a sleek and stylish contemporary design in a choice of chrome or black trim, complemented by a choice of either realistic looking coals or pebbles. It requires a conventional chimney flue for safe operation. When this gas fire is turned on, the polished mirrored side panel nicely reflects the dancing flames and makes this fire look larger than it actually is. The Bellagio Blaze Deluxe is constructed of only the finest quality high-grade materials for good looks as well as durability. It can be conveniently controlled using either a manual or remote control system. With a 4.2kw heat output, it offers an admirable 61-70% fuel efficiency rating, making this model an ideal way to add warmth as well as heat to any room in the house. The Bellagio Blaze Deluxe has quickly become one of the most popular models produced by the Crystal Fires brand. We wanted i hole in wall fire but was not to sure on which to go for we saw this and glad we bought this really nice hot fire. I WAS LOOKING FOR A SPACE SAVING FIRE AND SAW THIS. IT IS VERY MODERN AND VERY HOT. COULDNT HAVE ASKED FOR ANYTHING BETTER REALLY. HIGHLY RECOMMENDED.